You can view portions of the Huron Swamp and the woods of Indian Springs by hiking, skating or pedaling the parks paved Hike-Bike Trail. The trail is a 5-mile asphalt ribbon that extends from the Meadowlark Picnic Area to a small loop in the northeast corner of the park. 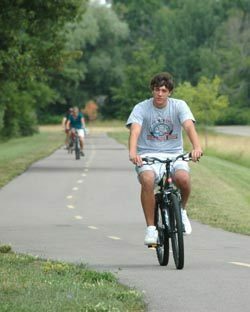 The round trip from the picnic area is an 8-mile walk or ride. 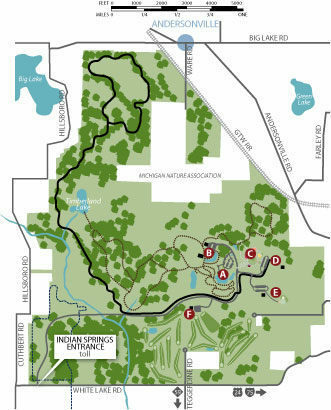 You can view portions of the Huron Swamp and the woods of Indian Springs by hiking, skating or pedaling the park’s paved Hike-Bike Trail. The trail is a 5-mile asphalt ribbon that extends from the Meadowlark Picnic Area to a small loop in the northeast corner of the park. The roundtrip from the picnic area is an 8-mile walk or ride. For the most part the trial is level and easy with exception one long hill near the beginning. Since the majority of it is through a wooded/wetland area, the best time of year for the Hike-Bike Trail is either late spring, when there is a profusion of wildflowers, or in the fall, when the leaves of the maple and oak that forest much of the area, turn shades of autumn. During late June and early July, Indian Springs usually has more than its share of mosquitoes and deerflies. Beginning at the Meadowlark Picnic Area, you quickly cross the Park Road and then parallel it for the first mile through open fields. A descent of a steep hill soon follows after crossing the road. At Mile 1, you cross a feeder creek to the Huron River and then follow the path as it swings sharply to the north, leaving behind the Park Road and open fields and entering the woods, a far more interesting setting. Even if you never stray from the trail (who wants mud on their shoes? ), you can peer through the trees to view the wet ground and an occasional stagnant pond -characteristics of a swamp. In late spring and early summer, flowers, such as wood lilies, black-eyed Susans, and woodland sunflowers, add a dash of color to the ride. Both the kilometers and the miles have been marked on the path and just before reaching Mile 3, you pass the largest ponds, as well as some large open fields that were once farmed. At Mile 3 is a junction in the trail, along with a rest area that has toilets and a picnic table. Go either direction on the 2-mile loop through woods and open fields before returning to the rest area, where you will backtrack to Meadowlark Picnic Area. Keep in mind that the hill everybody went flying down at the beginning is now a long uphill climb, especially for the short legs of six- and seven-year-olds on a bicycle. Luckily, at the top, under a large shade tree, is a bench where you can rest and enjoy a pleasant overview of the Huron River flowing south out of the park.